The Food and Drug Administration (FDA) notified health professionals of a Class I Recall of Mizuho OSI Modular Table Systems because of reports of patient injury related incidents. Mizuho previously provided warnings and recommendations for safe use of the Mizuho Modular Table Systems, including performing a verification count of all the T-pins to confirm the stability of the table top. Mizuho OSI Modular Table Systems are used for patient positioning during a diverse set of orthopedic trauma, thoracic, and spinal surgery procedures. It has been reported that the removal of the T-pins that support the bottom base, instead of the T-pins that support the top, may result in patients falling to the floor. 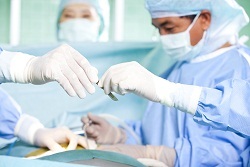 Another potential concern is unexpected movement/tilting of the table, resulting in unanticipated movement and/or patient falls during surgery.